The Preston™ Biopsy Needle with clockwise-cutting trephine teeth is for use through our 11G introducer needles. Visual depth gauge and centimetric markings will show protrusion beyond the appropriate 11G, 10cm or 15cm access needle (when using with Preston™ Bone Accessories or Merit Bone Biopsy Systems). The Preston™ Hard Bone Access Needle with Drill may be used to gain access through cortical bone for subsequent procedures. Contains introducer (with perforating cannula and trocar-tip stylet), and exchangeable drill insert. 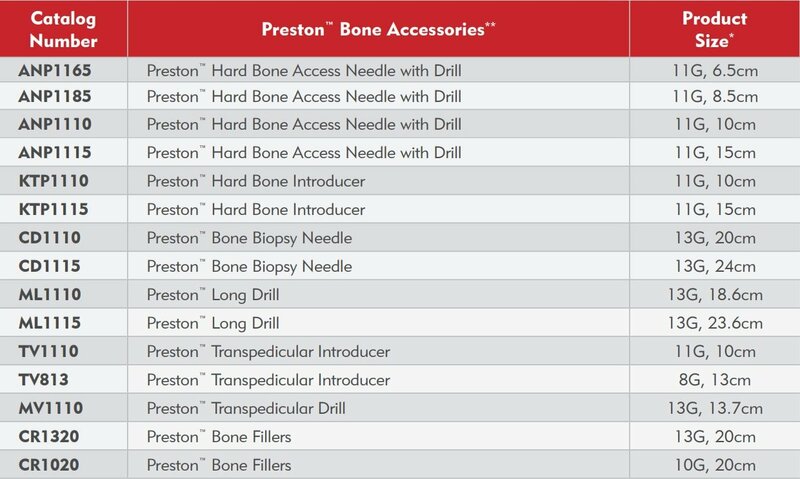 The Preston™ Hard Bone Introducer contains a sharp guide rod, perforating cannula and drill. It may replace the blunt cannula included in the corresponding size Westbrook™ and Kensington™ Systems to traverse dense bone before biopsy. The Preston™ Long Drill may be used through the appropriate perforating cannulas in order to make an extended pathway through particularly dense cortex. This perforating cannula and trocar-tip stylet is designed for accessing and traversing vertebral bone. The access provided allows for a subsequent bone biopsy and/or cement delivery. The 11G, 10cm introducer features a removable handle and wing-nut to facilitate multi-level procedures and device removal. Exchangeable drill insert for supplemental use with the Preston™ Transpedicular Introducer (TV1110) to progress through dense cortex. To be used through the Preston™ Transpedicular Introducers with the cement of your choice. Depth markers will show protrusion of blunt end of the bone filler outside of Introducer, when using with the appropriate Preston™ Transpedicular Introducers.